Snow falls on Maisy's, Charley's, Cyril's, Tallulah's, and Eddie's houses on Christmas Eve. Join them on this simple story that tells of hanging stockings by the fireplace, making pies, and hanging colorful decorations. Oh, and also rescuing a friend caught in the snow. All ends well with the whole group singing carols around the Christmas tree. 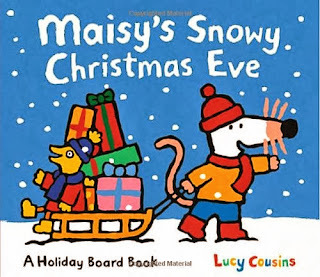 A lovely, colorful Maisy book with sparkly snow on the cover. What could be better? Don't tell my grand daughter, but she is getting this book for Christmas!